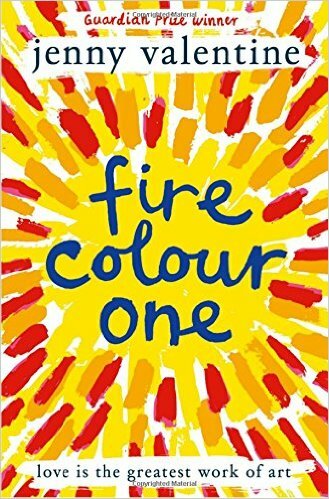 Fire Colour One is an engrossing drama of a dysfunctional family collapsing in on itself through selfishness, difference and lies. Iris, the narrator, is the teen daughter of glamorous LA types that are too busy preening, trying to make it big on screen, maxing out their credit cards and drowning their sorrows with vodka to care too much that their daughter has turned to arson as a method of expressing (or repressing) her feelings. Fire Colour One is also a painting by Yves Klein, that according to the novel's characters, is unforgeable. To Thurston, an anarchist prankster and Iris' only friend and Ernest, a dying art collector and Iris' estranged father, Klein brings to the canvas an immediacy, an intensity and a genius streak of rebellion that cannot be imitated. That vibrance and fire characterises the whole novel really- its characters refuse to conform. Starkly contrasted against the phony too-white teeth of Hannah and Lowell, Iris, Thurston and Ernest are liberated. Like Klein, they make their own rules, their own art. Iris is, however, an unhappy teenager. Solitary, save for her one friend Thurston, she lurks around Los Angeles finding things to burn so she doesn't have to feel anything. Mostly ignored by her mother, blamed for ageing her, blamed for Lowell not making it big, blamed for most things. The novel opens with Iris stacking crates in a huge bonfire in her recently reconnected, recently deceased father's honour. It's his funeral, and everything about it has been disgusting to her; the showiness of her mother's power-accessories, the carpets in the crematorium, her stepfather's posy boredom. The plot then backtracks to how this came about, how Iris found her father and witnessed his final, befitting revenge. It transpires that Hannah, Iris' designer label-hungry vodka hoover of a mother decided out of the blue to call Iris' father, Ernest; a man that according to legend, abandoned the infant Iris and his wife, taking his millions and disappearing into thin air because he never wanted to be a father. He is gravely ill and does not have much time. Upon meeting her biological father, possibly for the first time, Iris quickly develops a bond with this fading, bedridden man that she might once have had a relationship with; they share a love of art, a disdain for money and a wondrous curiosity. They get on like the proverbial house on fire. Making the most of each remaining day, Ernest shares his stories with Iris, mistaking her, in his morphine haze, for his long dead sister. Iris gets to find out more about the family she could have had, just as its last member is wasting away. Hannah hovers outside, waiting for her still-husband to hurry up and die so she can claim his wealth. I absolutely loved this book. I was mostly impressed with the prose; it managed to be beautifully subtle but at the same time incredibly rich. It was a heartbreaking joy to read. The descriptions of the fire and how the fire makes Iris feel transport the reader straight into her head- it seems to make so much sense from her perspective and that's communicated brilliantly. She's a fascinating character and an engrossing narrator- I loved how smart she was and how her casualness defined her. Never forced, never trying too hard. She's just naturally counter cultural, born to swim against the tide. I loved Ernest too, how bitter-sweet it was for him to have finally been reunited with the daughter he'd searched for all these years, but has, at most, a couple of weeks left to live. I liked that it's a story about a teenager who doesn't fall in love, it was refreshing to see. I liked were we left Iris- liberated from her parents, not exactly a happy ever after, but the conclusion has potential. It's filled with a wonderful sort of balance to the story and despite the fact that it begins and ends at the funeral, it's such a celebration of life and art and rebellion that it's impossible not to enjoy Fire Colour One. There's a satisfaction to the ending, the fruits of a revenge twelve years in the making and an overall theme, basically, of YOLO. It seems that lies and discovering that the truths that you've always taken for granted turning out to be fabrications is very much the theme of this year's Carnegie shortlist. I don't think this book hits hard enough to win, sadly, but it's a beautifully constructed and wonderfully written novel about family, art and being allowed to pursue the things that matter.